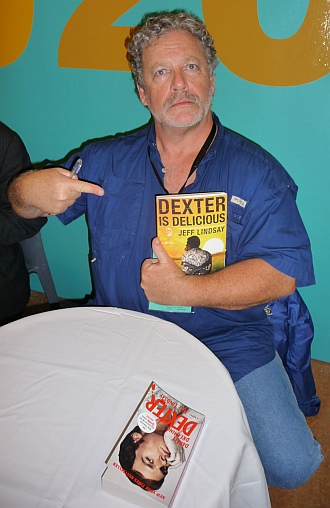 via: staugustine.com: Jeff Lindsay is the award-winning author of the New York Times bestselling “Dexter” novels on which the international hit TV show, Dexter, is based. His books appear in 39 languages around the world. Jeff also is a witty and delightful presenter who will deliver the opening keynote address on Thursday night, Sept. 13. Not only will participants learn a great deal about how “Dexter” came to be and how Jeff’s mind works to craft such a complex character, guests will be highly entertained in the process. His wife is Hilary Hemingway, who not only writes with her husband but also is an award-winning screenwriter, working for studios such as Warner Bros. and Paramount Pictures. She also is the niece of Ernest Hemingway and will be accepting the Posthumous Literary Legend Award for Lifetime Achievement in honor of her uncle at the Literary Legends Banquet on Friday night, Sept. 14. In addition, Hemingway will be one of the presenters on Saturday, Sept. 15, during the free day of literary events to be held at the Ringhaver Student Center at Flagler College. She will discuss her uncle’s life in Cuba, her PBS documentary, and the feature film she and actor-director Andy Garcia are developing.